GlusterFS is a distributed file system which can be used to build volumes that span several hosts. It's used in a variety large scale cloud and web hosting applications. 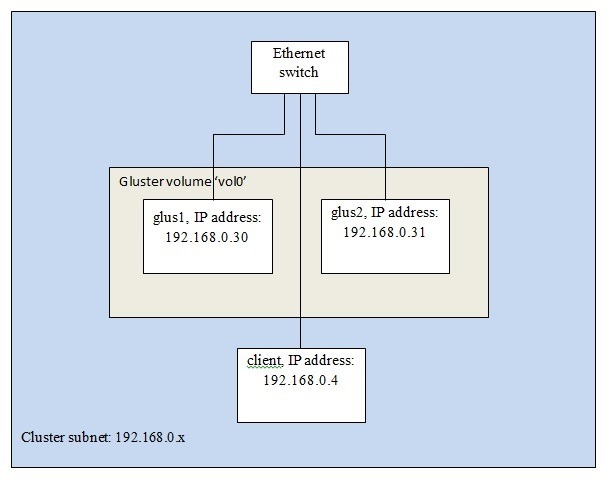 A GlusterFS volume is a virtual disk which can be read and written from across a network. GlusterFS can be used to build high perfomance storage clusters that hold large volumes of data. The data in GlusterFS volumes is divided into bricks, where each brick is a portion of a pysical drive that's used to store volume data. In practice a brick is just a directory whose contents are shared over the network. Bricks can be replicated for improved fault tolerance. If one of the disks in a GlusterFS node dies, all the data in that drive's brick will be lost. If the cluster has been configured for replication, then any brick that is lost when a disk fails is available on another node. The broken disk just needs to be replaced and GlusterFS will automatically rebuild the lost brick from the contents of the other bricks. Bricks can be distributed across more than one server to improve performance. This means that individual files may be written to different servers, even if those files are in the same directory. Distributing files helps to balance the load on the servers. If a volume contains a lot of files, spreading them across more than one server helps to spread the load when they are accessed. GlusterFS supports striping where parts of a file can be written to different disks. Usually this is only recommended for very large files. I installed Raspbian on three Banana Pis - one client, and two nodes for a simple storage cluster. The client Banana Pi gets its IP address from the local DHCP server, and the Gluster nodes have static IP addresses - 192.168.0.30 and 192.168.0.31. Creation of volume glusv0 has been successful. Please start the volume to access data. I set up another Banana Pi running Raspbian. Again I used bpi-config to set the hostname and password. The -o option is used to pass the backupvolfile parameter which sets an alternate host name to access the volume in case the first server goes down. The client will automatically re-mount the volume via glus2. This will execute two commands when the server boots up: the first is just a 10 second delay to allow the GlusterFS daemon to boot, and the second command mounts the volume. You may need to make your Pi wait longer before running mount. If your Pi doesn't mount the volume when it boots, try using 'sleep 15' instead. This isn't an ideal way to fix this problem, but it's ok for most uses. Now your Banana Pi powered storage cluster should be up and running. 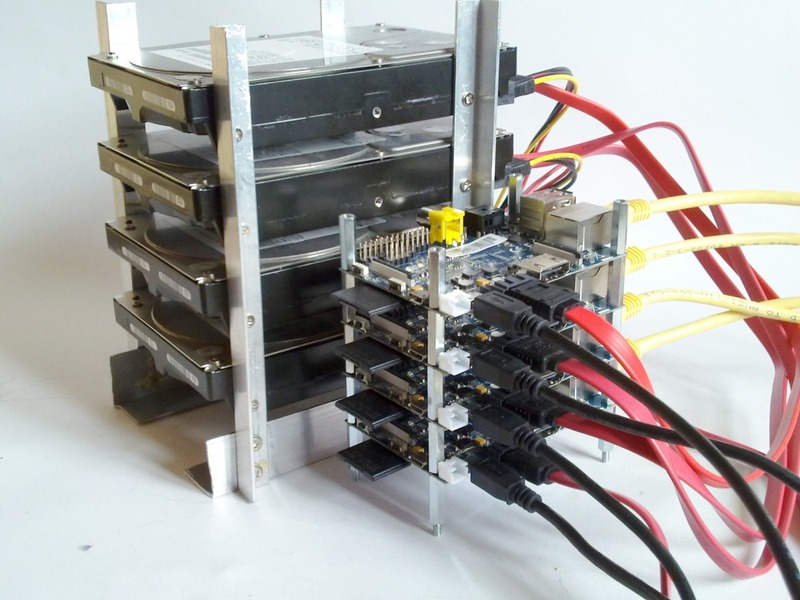 In this post I'm going to set up GlusterFS volume on four Banana Pi servers, each with its own SATA hard disk. The volume will have two bricks, each occupying one disk. The bricks will be replicated on the two remaining disks. I'm using a fifth Banana Pi as a client which I will use to access the volume. The client has a mouse, keyboard and monitor attached to it. I'm using ssh to connect from the client to the nodes in the cluster. All five Banana Pi boards are connected to an ethernet switch. I'm using four 1TB hard disks. I'm using replication, so although the total amount of disk space is 4TB, the actual capacity is 2TB. Some of that space will be taken up with file system overheads, so there will be around 1.7TB of space available to store data. The hard disks are powered with a PC power supply. I ran bpi-config on all nodes to set basic parameters. I gave the nodes in the cluster host names glus1 to glus4, andd I set static IP addresses ranging from 192.168.0.30 to 192.168.0.33. Building a new DOS disklabel with disk identifier 0x7a48f006. Set up the other three servers the same way. Creation of volume vol0 has been successful. Please start the volume to access data. Next I need to configure the client to mount the volume every time it boots. This would normally be done by adding a line to fstab, but the last time I set up Gluster I found that adding a line to the client's fstab file didn't work. When the Pi boots up, the GlusterFS client daemon isn't available until after the fstab file has been processed. This caused the client node to fail to mount the voume. I used the -o option to pass the backupvolfile-server parameter to the Glusterfs client. This means thst if there's a problem with glus1, the client will failover to glus2.